Prior to the Great Recession, financial imbalances and unsustainable growth trajectories co- existed with limited inflationary pressures in the United States and elsewhere (see Borio and Disyatat 2014). The implications of the financial cycle for the business cycle have since received increasing attention, but little is known as to how financial imbalances affect the natural rate of interest. In this paper, I extend the model of Laubach and Williams (2003) by introducing an explicit role for the financial cycle in the joint estimation of the natural rates of interest, unemployment and output, and the sustainable growth rate of the US economy over the 1961Q1- 2016Q1 period. In their seminal work, Laubach and Williams (2003) (henceforth: LW) estimated a time-varying natural rate of interest from a semi-structural model with the Kalman filter. Employing a frame- work inspired from the New Keynesian model, the LW statistical model and related empirical studies identify the unobservable natural rate of interest via the output gap in a dynamic IS equation, while the unobservable output gap estimate is informed by inflation dynamics via the Phillips curve. One limitation, however, is that financial imbalances are absent and do not play a role. Kiley (2015), Cukierman (2016) and Taylor and Wieland (2016) have argued that the omission of factors that are likely to influence output fluctuations – such as credit or more broadly, the financial cycle – may result in mis-specification and affect inference as regards the natural rate of interest. Another limitation is that updated estimates of output gaps from the LW model since the Global Financial Crisis (GFC) have shown substantial deviation from results derived on the basis of production-function approaches; consequently, their plausibility has been questioned (see Kiley 2015, Pescatori and Turunen 2016). Such doubts extend to the plausibility of the natural rate of interest estimates, which are closely tied to the position of the business cycle. 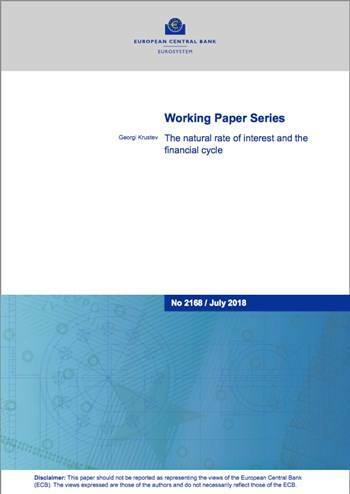 The main contribution of this paper is to assess the effect of financial imbalances on the natural rate of interest in the LW model and by doing so, address concerns about omitted variable bias and obtain more plausible estimates of business cycle dynamics. In extending their framework with the financial cycle, the natural rate is modelled as a function of sustainable (“finance- neutral”) output growth, a concept advocated by Borio et al. (2017). This allows to distinguish low-frequency movements in the trend component of the natural rate from temporary but per- sistent deviations due to headwinds and tailwinds associated with the financial cycle. The main findings can be summarised as follows. First, the natural rate of interest consistent with stable prices experienced a sustained decline over the sample period. Second, strong and persistent headwinds due to financial deleveraging have lowered the natural rate of interest on average by around 1 p.p. below its long-run trend over 2008-14. This might have impaired the effectiveness of interest rate cuts to stimulate the economy and lift inflation back to target immediately after the GFC. The dissipation of these headwinds implies that monetary policy should have regained traction since 2015 as the natural rate of interest rebounded, aligning itself to its long-run component. Finally, uncertainty around the estimates is large, a common feature found in related studies using similar methodologies.